For 4 generations the Frerich men have been crushing rock and moving earth. Dating back before the war, Arnold Frerich was working longside his father, Ben, learning everything he would eventually pass on to his son John. Today John carries on this family tradition with his son, Blake. 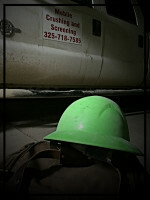 Mobile Crushing and Screening Inc. is a 3rd and 4th generation family owned and operated business. Founded on solid ground of honesty, integrity and endless work ethic, John and Blake Frerich offer a combined 50+ years of experience in the dirt construction industry. Customer satisfaction is second to no other aspect of Mobile Crushing and Screening. While producing the highest quality material in Texas, John and Blake put their customers first and treat you like family. We have a diverse portfolio, including projects in the oilfield, pipeline, wind turbine, and road construction industries. We believe that building strong client relationships is incredibly important and we work closely with our clients to yield complete trust.